Now you might be wondering what makes WordPress.com different from WordPress.org. Well, one of the major difference is the hosting plan. With WordPress.org you are responsible for your own hosting. That means you host your own website or your blog. On the contrary, WordPress.com takes care of all the hosting. Thus, WordPress.org and WordPress.com are two very different platforms. Hence, one has to be very careful while choosing the right platform. After all, your online success largely depends on the platform you chose. Having said that, let’s get along the Best WordPress.com themes. 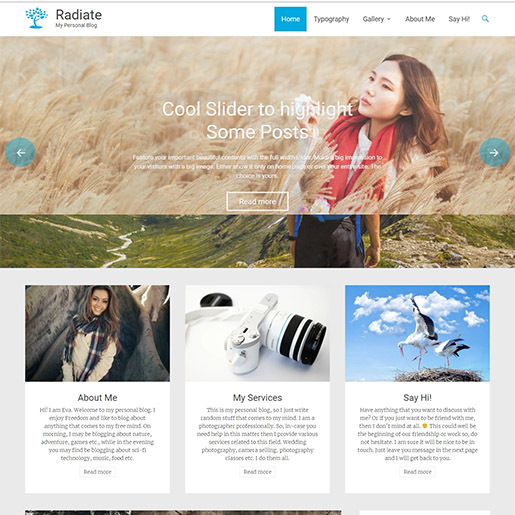 Radiate is simple yet creative and clean personal blog WordPress theme. This retina read theme also supports parallax header image. Apart from that, it is also fully responsive. Thus, it perfectly adapts to any kind of devices like desktop, tablet or any other hand-held devices. Moreover, its minimal design makes this theme more alluring. Radiate also supports the featured content in a slider that allows you to showcase your most important posts as well pages. Furthermore, this theme is search engine optimized and WooCommerce compatible. Besides, it is also optimized for speed. It offers more than 600 Google fonts. 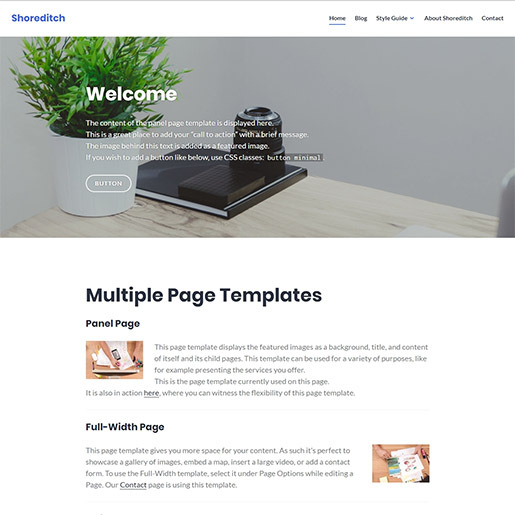 Next, in the list of WordPress.com themes, we have Shoreditch. Shoreditch is a highly responsive multipurpose theme ideal for improving your business’s online presence. Primarily, this theme was crafted for the business purpose only. However, being a responsive template it is suitable for all other websites like a personal blog. This theme comes power packed with plenty of outstanding features. Some of the features are responsive layouts, featured posts, multiple page templates, testimonials and more. Besides that, it offers two custom page templates options: Panel page template and full-width page template. True to its name, this theme has been beautifully crafted with great attention to details keeping weddings in mind. 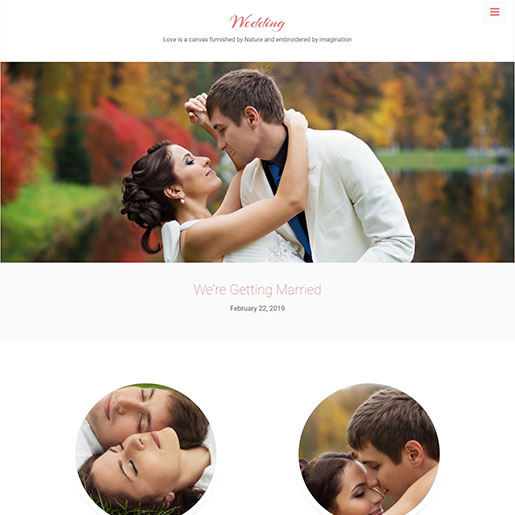 Wedding is a perfect theme to create stylish wedding websites. However, it is also suitable for photography, travel, and other kinds of similar portfolio websites. Moreover, it provides a whole lot of useful features to professionally display wedding related information as well as photos, videos, and slideshows. Plus, this theme is extremely easy to use and manage. Furthermore, it features different blog layouts and theme layouts. Best of all, wedding theme comes with four powerful templates. Namely, Bridesmaid Page, Front Page, Full-Width Page, and Groomsmen Page. Next, we have is Gateway. Gateway is a responsive multipurpose theme that perfectly suits different needs of a variety of users. Be it for a blogging site, business or a personal website, this versatile theme makes every kind of website stand out. Moreover, its homepage design consists of full-width header background image along with an area for featured posts as well as a featured video. Besides, it allows you to create “call-to-action” buttons with customized texts. Furthermore, you can also select up to three posts or pages to be featured from the featured on the homepage. 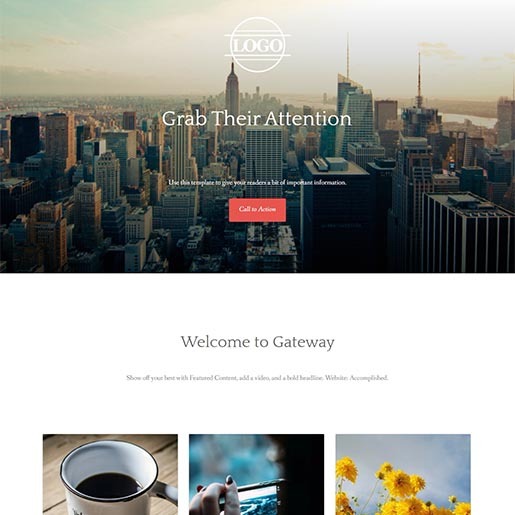 Gateway includes a custom page template and full-width template together with four optional widget areas. Moreover, its theme is powered by the Options Framework. Besides being utterly simple to set up, this theme also allows you to put your recent projects, latest blog posts as well as featured post on display on the front page. Additionally, you can also use the overhanging images, drop caps and sub-heading to make your content look more stylish. 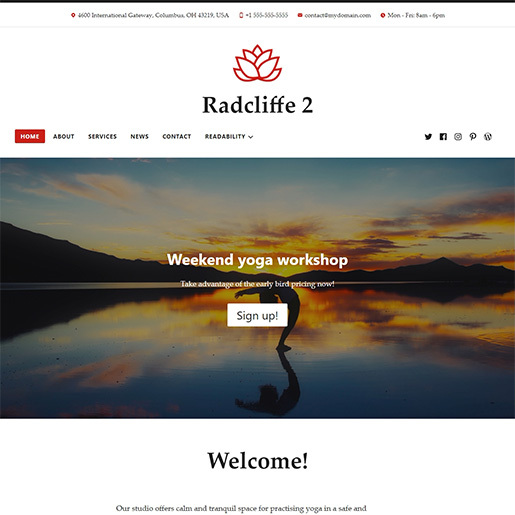 Radcliffe-2 is a clean and minimalist WordPress theme developed by Anders Noren. In this list, it is one of the free WordPress.com themes. This theme is specially designed for small business owners and entrepreneurs. However, it is suitable for blogging as well. Apart from that, this theme has a three set of style packs at your disposal. Basically, style pack is a combination of custom colors and different fonts. Moreover, it allows you to give a personal touch to your website by adding your business’ logo. In addition, you can also promote your most important messages easily with this theme. All you need to do is write a headline, brief description and a prominent link to redirect the visitors where you want them to. That’s it, your message will be displayed on the front page of your website. Custom colors, header and menu options. 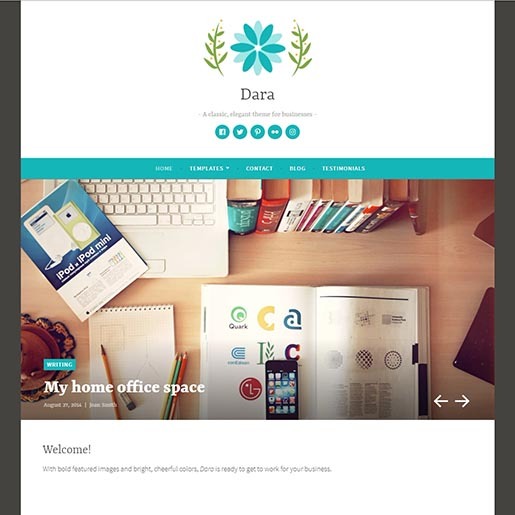 Dara is a beautiful yet powerful WordPress theme that comes loaded with powerful features. It integrates custom menus in the header section that can be configured through the dashboard. Moreover, it also offers social links menu through which you can easily display your social media profiles. You have the option to display them in the header as well as footer section. Furthermore, Dara consists of four widgets areas. One is the optional sidebar that appears on the right side of the blog view and on pages. And the rest three is in the footer area. Keeping in mind the importance of brand identity, this theme also supports site logo feature. It also consists of the testimonials section. Besides, either you want a custom color, pattern or a stunning image as a custom background of your website, the choice is completely yours. 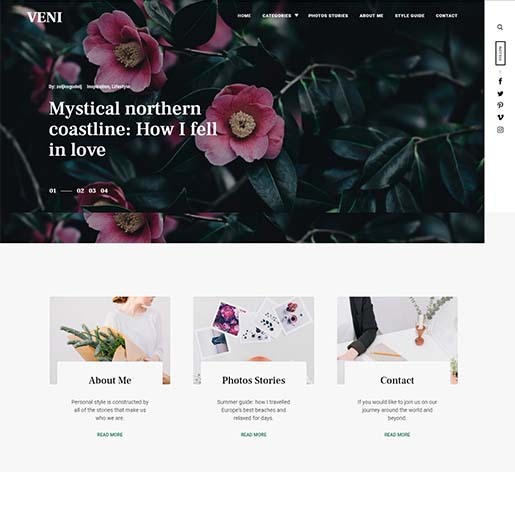 Veni is a modern, lightweight WordPress theme by the Themes Kingdom. It is one of the best WordPress Blog themes among the WordPress.com themes. 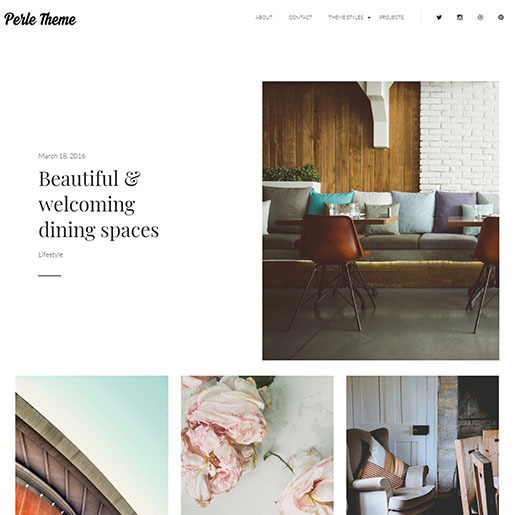 This theme can be the ultimate choice for the ones who opt for clean but stylish layouts for their blog post. Moreover, it comes loaded with a pool of blogging options and capabilities which makes it a breeze to create highly professional blogs. Furthermore, it provides you with two options to showcase your best posts. You can either set your slider to full-screen or can opt for the smaller slider. It is totally your wish. Besides, you can also display up to three featured pages right under the slider. Apart from that, it consists of flexible layout options, custom colors and many more. 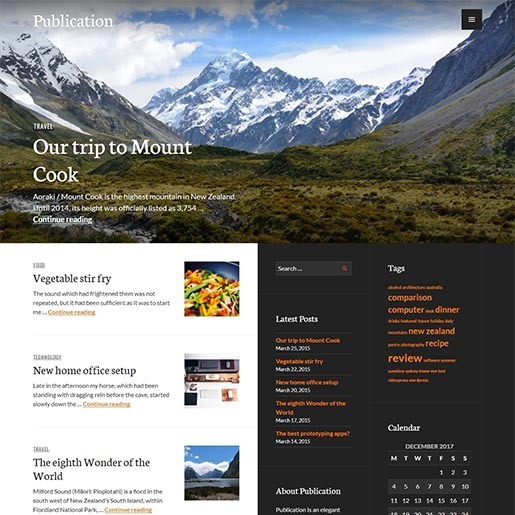 Publication is a clean, beautiful WordPress Blog and Magazine theme designed by Thomas Guillot. This theme best fits all kinds of websites. Be it fashion, travel food and any other. Apart from the elegant design, this theme provides advanced options to give a personalized look and feel to your posts. Moreover, it integrates a sliding panel which consists of the main navigation and the social links menu. Furthermore, it offers two widget areas and supports the site logo feature. In addition, Publication emphasizes the large, full-screen features image so as to enhance your story. 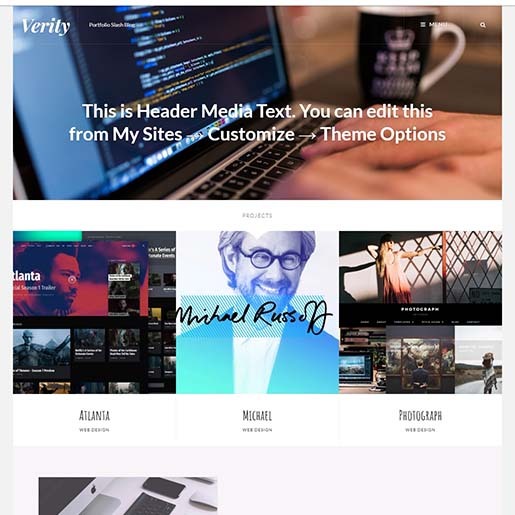 Verity is yet another top-notch Blog and portfolio theme on our list of best WordPress.com themes. This is a beautiful, ultra-clean theme developed by Catch Themes. With its gorgeous design and outstanding features, this theme happens to allures not just the professional bloggers but the random blog writers as well as the photographers and illustrators. Along with the balanced color palette and beautiful typography, it provides a comprehensive and user-friendly platform to come up with a professional blog. Moreover, it is in line with Jetpack. Furthermore, it features responsive design, multiple widget areas, font family options, layout options and many more. These features, if utilized properly can create blog and portfolio that stands out stunningly in the crowd. And next on our list of WordPress.com Themes is Wayfarer. 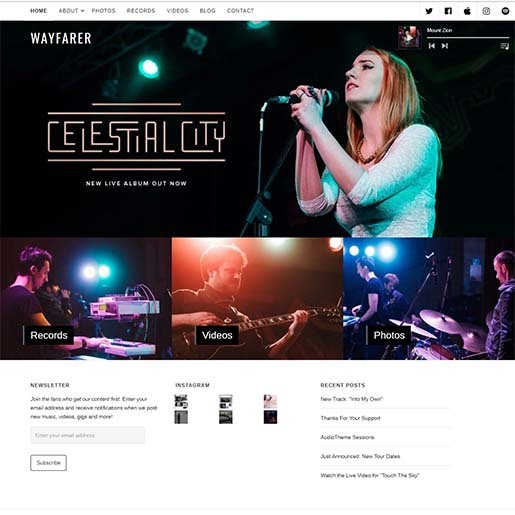 Wayfarer is an outstanding WordPress music theme by AudioTheme. If you are looking for a spectacular content focused music theme then this can be the best choice. This theme is suitable for the musicians, bands, singers, and orchestra who wants to share their professional details whilst increasing their online presence. Furthermore, it provides you the perfect platform to showcase your music, videos, gigs and other contents. Wayfarer comes with a built-in audio player. Thus, it allows you to highlight the custom playlist and also to promote sample songs from the new albums. The “Upcoming gigs” section on the theme allows you to update your upcoming shows and events to people, especially your fans. Through this section, one can also buy tickets through the link provided. Last but not the least, on the list, we have is Aperitive by the Themes Kingdom. 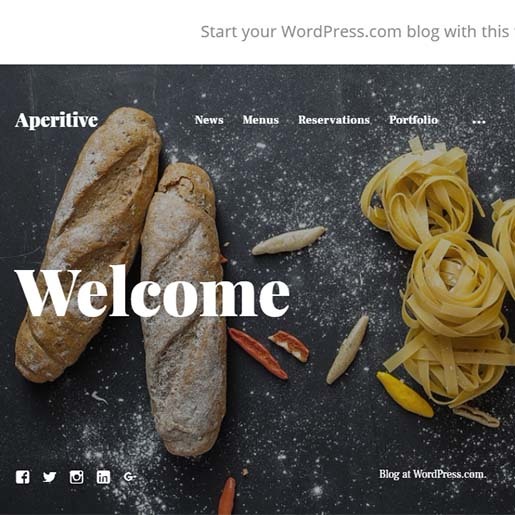 Aperitive is one of the best restaurant WordPress themes among WordPress.com themes in the niche. It is simple yet sophisticated. This delicious restaurant theme fits into all sorts of hotels and food businesses. Thus, it can be the ultimate choice for those in the hospitality industry. Aperitive comes with features that make it easier to wonderfully display your cuisines, culinary skills and beautiful as well as comfortable ambiance to your visitors. This theme has a bundle of themes options available in the back end along with the advanced typography options. Moreover, it consists of simple fixed two block layouts that is becoming very popular in the recent time. Furthermore, the news page, menu and reservation pages in the theme acts as the icing on the cake. On top of that, the slide-out widget area also makes the theme stand out. Did you find this article helpful? Or is there anything I missed? Please let me know about it through your valuable comments. If you like this article, here are the links to more of such articles which you may want to go through. ← How to Use Facebook Debugger to Fix the Issue of Open Graph Meta Tags? I’ve been using word press for long time. Word press is simply best. I am a web developer and designer. I love to explore new themes, designs and styles into the world of web internet. The article is great help for me to learn new themes and designs to use word press more efficiently. Thanks for sharing. Simply i love Word Press!!! Before that i was using core PHP. But when i moves towards this tech it helps me to sole my problems quickly.